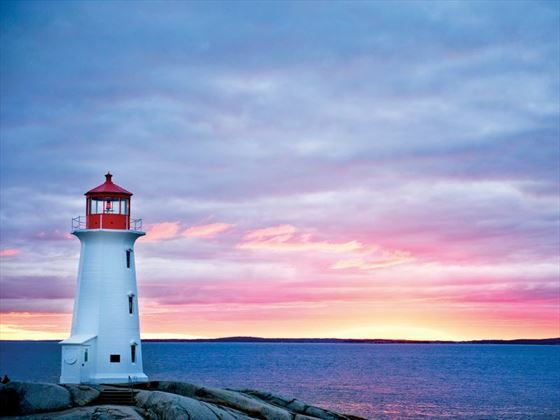 This combines the Atlantic Maritimes tour and Circle Newfoundland & Labrador tour, to offer a superb exploration of the maritimes provinces of eastern Canada over the course of three weeks. This is a real treat of an itinerary, allowing you to immerse yourself in the beautiful scenery, rugged coastline, stunning seascapes, fascinating history and charming culture of this remote part of the world. The tour includes many visits to national parks and historical sites, several boat trips and a wide variety of meals (including two lobster dinners and a Viking Feast!). You’ll have a dedicated tour manager throughout who will be enable you to appreciate all the highlights of these provinces. Arrive in Halifax and transfer independently to your hotel in this great little capital city. Meet with your Tour Director and fellow travellers at an evening welcome reception. Today sees you explore the Bay of Fundy and learn about the world’s highest tides as you journey along the colourful coastline to the city of Moncton. Along the way you’ll visit the Joggins Fossil Cliffs – a UNESCO World Heritage Site. After crossing into New Brunswick you’ll enjoy an unforgettable culinary experience as you cruise the warm waters of Shediac Bay on a lobster boat; learn about the fishing industry and enjoy a delicious lobster supper. You’ll arrive in Moncton later on in the day. Overnight: Crowne Plaza Moncton Downtown (Continental breakfast and lunch and dinner cruise included). 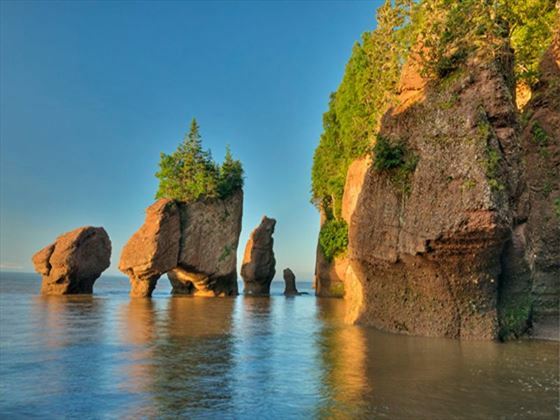 This morning you will visit Hopewell Rocks on the coast of the Bay of Fundy – a really inspiring natural wonder. These large flower pot-shaped formations are sculpted by the highest tides on the planet. 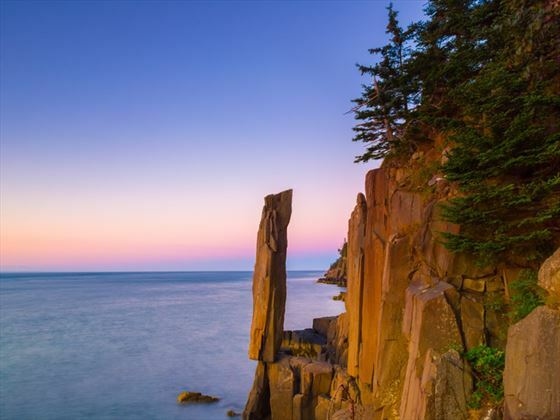 You’ll travel through Fundy National Park on to Saint John on the southern New Brunswick coast, then take a city tour including the Reversing Falls before checking into your hotel for the night. Overnight: Hilton Saint John or Delta Saint John (Breakfast and lunch included). Take a day trip to picturesque St. Andrews-by-the-sea today – a captivating and quaint destination. Go on a whale-watching boat tour (weather permitting) then enjoy an afternoon at leisure where you can chat to the friendly locals, admire the architecture and explore the rich marine life before returning to Saint John. Spend some free time in Saint John this morning before departing via ferry to Nova Scotia. As you travel, be sure to keep a look out for whales as you cross the Bay of Fundy. 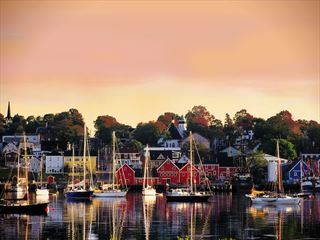 Arrive in Digby and be enchanted by this historic town. Overnight: Digby Pines Golf Resort & Spa or Old Orchard Inn (Breakfast and dinner included). Today sees you depart for Halifax where you’ll have chance to learn about the French Acadians who established the first settlement here in the early 1600s. You’ll visit the Grand Pre National Historic Site where fact and fiction are combined to reveal the romance of the ‘Land of Evangeline’ and you’ll also take part in a local winery tour and tasting session before arriving in Halifax in the evening. Overnight: Cambridge Suites Halifax (Breakfast included). This morning you’ll head to the renowned fishing village of Peggy’s Cove for breakfast then journey along the south shore of Nova Scotia to the World Heritage Town of Lunenburg. There will be a walking tour so you can fully experience the colonial settlements in the New World, as well as a visit to the Fisheries Museum of the Atlantic to learn about the famous seafaring heritage in the town. Afterwards, you’ll head to Mahone Bay where you can enjoy some free time before continuing on to Western Shore for your overnight stay and Oak Island – home of the world’s longest running hunt for lost treasure. Overnight: Atlantica Hotel & Marina Oak Island or Cambridge Suites Halifax (Breakfast and dinner included). Today you’ll arrive on Prince Edward Island via the Confederation Bridge – the world’s longest continuous multi-span bridge. Along the way you’ll learn about the fascinating Mi’kmaq culture at the Glooscap Heritage Centre and Mi’kmaq Museum. In the evening, enjoy true maritime hospitality with a traditional hall-style lobster supper. Overnight: Rodd Charlottetown / Rodd Royalty Hotel / Delta Prince Edward / Holman Grand Hotel (Breakfast and dinner included). Overnight: Rodd Charlottetown / Rodd Royalty Hotel / Delta Prince Edward / Holman Grand Hotel (Breakfast included). 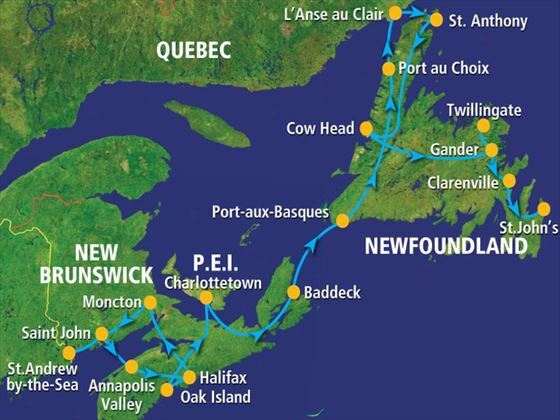 After breakfast you’ll board a ferry to Nova Scotia and proceed to Cape Breton Island via the Canso Causeway. There will be a visit to the Alexander Graham Bell National Historic Site in Baddeck then arrive at the Bras d’Or Lake where you can check-in to your hotel for the evening. Today you will journey along one of the most picturesque drives in North America – the Cabot Trail. 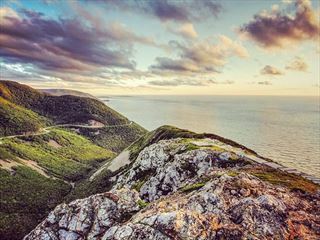 Winding along the rugged splendour of the Cape Breton shore, leading you to the incredible plateaus of Cape Breton Highlands National Park, the vistas available are unforgettable. Afterwards, you’ll travel to the coast for a whale-watching tour (weather permitting) before returning to Baddeck. Overnight: Inverary Resort (Breakfast, picnic lunch and dinner included). Cross over the Canso Causeway to Cape Breton Island and then in North Sydney board a Marine Atlantic ferry for a relaxing overnight crossing to Port-aux-Basques in the province of Newfoundland. Overnight: Marine Atlantic ferry (Breakfast & dinner included). 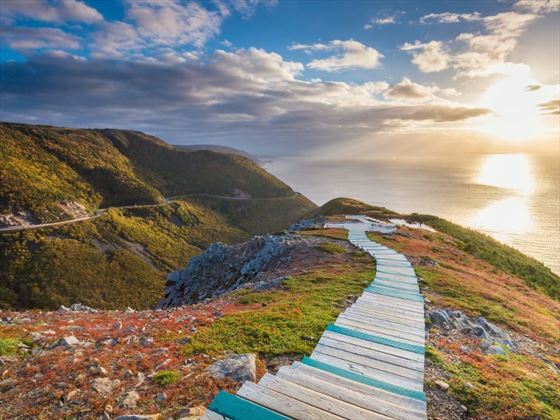 Arrive onto the island of Newfoundland and drive through the Cordroy Valley which is spectacularly framed by the Long Range Mountains, the Anguille Mountains and the shores of the Atlantic Ocean. Continue through the stunning Gros Morne National Park and into the small fishing community of Port au Choix, then check-in to the overnight hotel. Today board the ferry at St Barbe and cross the strait of Belle Island on the way to Labrador. Visit the Red Bay National Historic Site, location of a Basque whaling station in the 16 century. Return to Newfoundland and travel to L’Anse aux Meadows National Historic Site, an archaeological site marking the earliest known European settlement in North America. This UNESCO World Heritage Site gives a fascinating glimpse into the Viking lifestyle. Weather permitting this morning you will take a whale-watching boat tour. During some summer months enormous ice-bergs can also be spotted. So fingers crossed there will be some great photo opportunities today! Then travel to Cow Head, where you’ll be staying for the night. Today you’ll visit Gros Morne National Park, filled with a rich variety of scenery and wildlife. Embark on a scenic boat tour (weather permitting) on which you’ll learn about the geology of the Tablelands, see whales and bald eagles and discover the history of the small villages nestled along the shores. Travel through central Newfoundland towards Gander where you’ll check in for a relaxing evening in this small town with an interesting aviation history. Take the scenic drive along the coast of Notre Dam Bay into the beautiful town of Twillingate. At the tip of the island, visit the Long Point Lighthouse. Return to Gander and visit the North Atlantic Aviation Museum. Today’s route is along the Trans Canada Highway through the Terra Nova National Park, the most easterly of Canada’s national parks. You can spot wildlife on the way, whilst admiring the scenery. Visit Cape Bonavista Lighthouse Provincial Park and the charming town of Trinity. 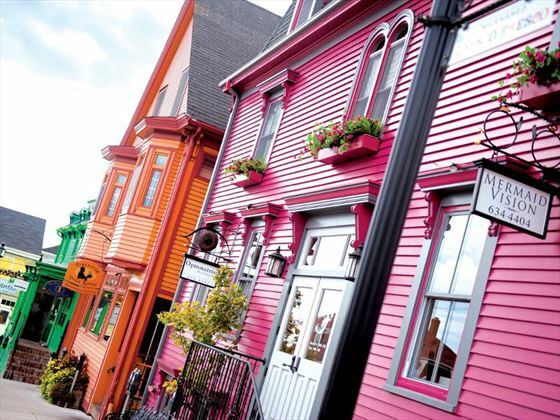 Head to the intriguing old seaport of St John’s, your home for the next two nights. North America’s oldest city and Newfoundland’s capital boasts a stunning location in the granite cliffs and slopes of the Avalon Peninsula. Enjoy a city tour featuring the Victorian architecture of the downtown area, the busy modern waterfront, the Cathedral of St John, Confederation Building and the panoramic view from Signal Hill. 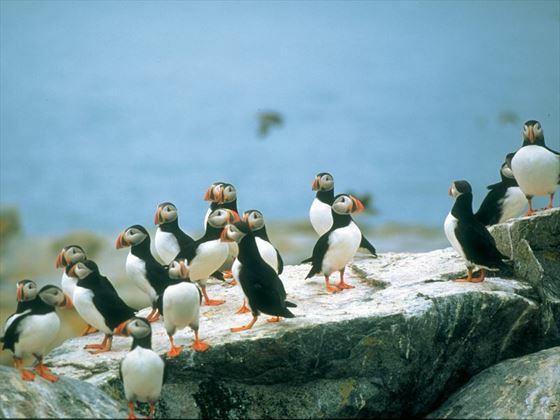 A highlight of the whole tour, today travel to Bay Bulls for a boat tour in the Witless Bay Ecological Reserve (weather permitting) to spot puffins and other seabirds. Then visit Cape Spear National Historic Site, the most easterly point in North America. You have free time this afternoon to explore the delightful neighbourhoods of St John’s.